The public knows far too little about the impact of the meat industry on global warming while in fact, meat nutrition is among its foremost causes. The UN's Food and Agriculture Organization (FAO) published a report in 2006 which revealed that the livestock sector generates 18% of greenhouse gases – more than the entirety of world transportation, which accounts for 16%. 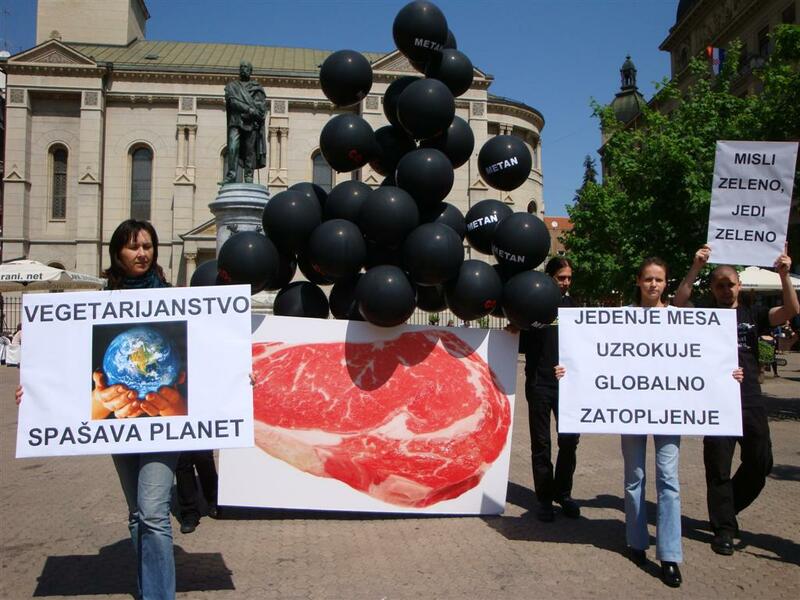 For this reason, Animal Friends will enact a symbolic representation of the impact of the meat industry on global warming. 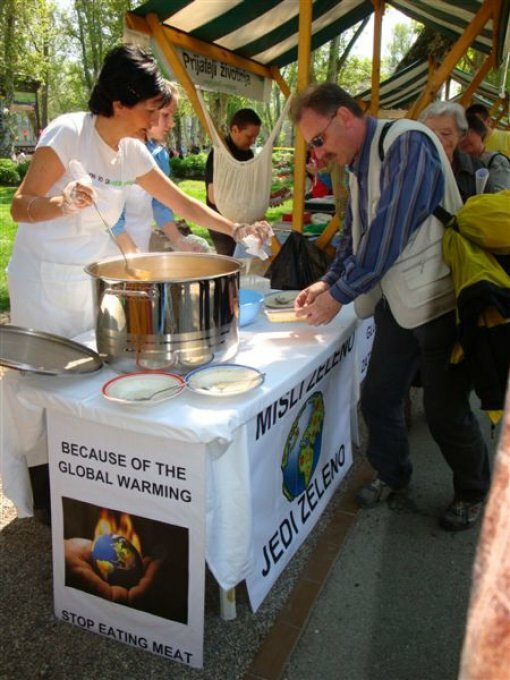 The performance, accompanied by an info stall, will take place on Wednesday, April 22, 2009 (Earth Day), at 12:00 A.M. on Petar Preradovic Square. In order to make people aware of the connections between animal-based nutrition and ecological disasters, educational leaflets will be distributed at the info stall, which Animal Friends has produced in collaboration with Greenpeace. 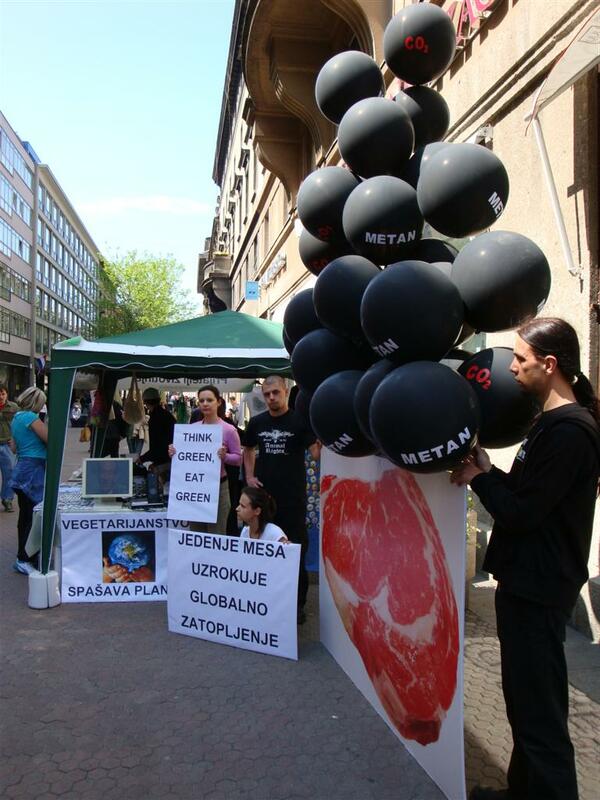 We will also be promoting the film "Meat the Truth," which will be premiering in Zagreb on May 2 at KIC cinema, Preradoviceva ulica 5. Citizens will have the opportunity to sign our current petitions and become informed as to the advantages of meatless nutrition. 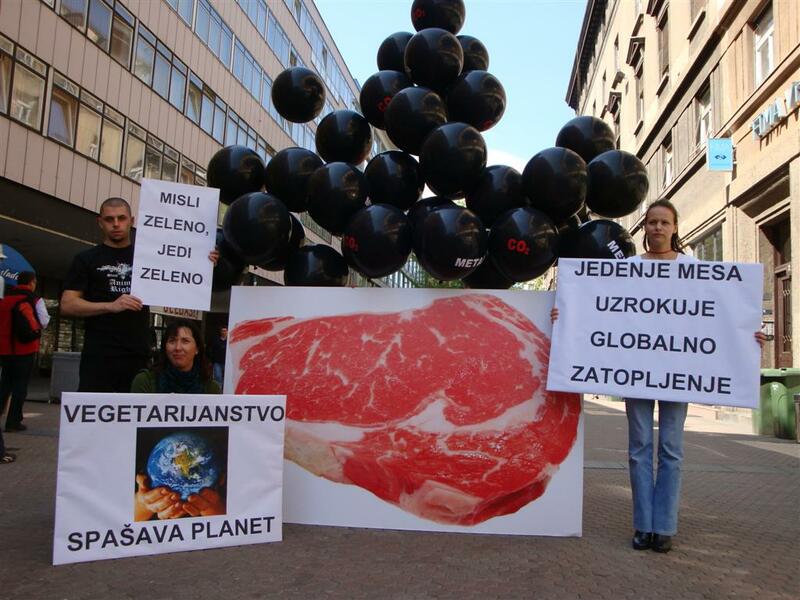 They will also be able to obtain free recipes and the scientific brochure entitled "The Livestock Industry and Climate – EU Makes Bad Worse," written by Jens Holm, a Swedish member of the European Parliament, and Swedish journalist Toivo Jokkala. 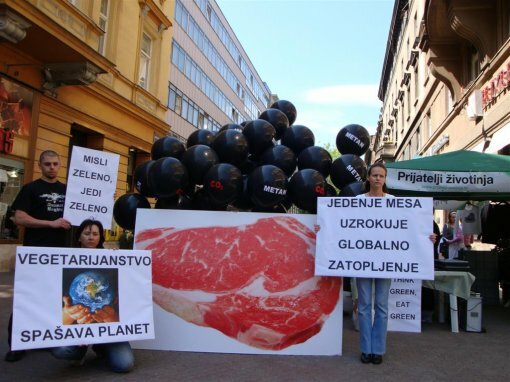 On April 25, Green Action will be organizing a presentation of producers of ecologically grown foods on Zrinjevac Square. Concurrently, Animal Friends will prepare a tasting of vegan eco-stew beginning at 12:00 noon in order to bring meatless nutrition closer to the public, since it protects the environment, animals, and human health. The principle greenhouse gases - methane, carbon dioxide and industrial fumes- are all inextricably linked to the meat industry. The primary sources of methane are due to both the clearance of forests required for cattle grazing and agriculture as well the gases produced by the animals themselves which is released in their excrement. Carbon dioxide pollution also rests mainly in the hands of meat producers: producing one kilogram of meat releases the equivalent of 3-4 kilograms of carbon dioxide! Its proven contribution to the production of greenhouse gases, in addition to the stupendous amount of energy production and consumption required for fertilizer production, forest clearance and maintenance of animal facilities, lands the meat industry firmly in first-place when it comes to causes of global warming. Having meat on your table is not worth the price of climate change or the death of anyone, be it pigs or polar bears, including ourselves.